I must admit that I do not know the exact history and origin of Nankhati (Nan-cut-tie) Biscuits in Goa but I sure do know they were sold at most Goan Bakeries and stores. 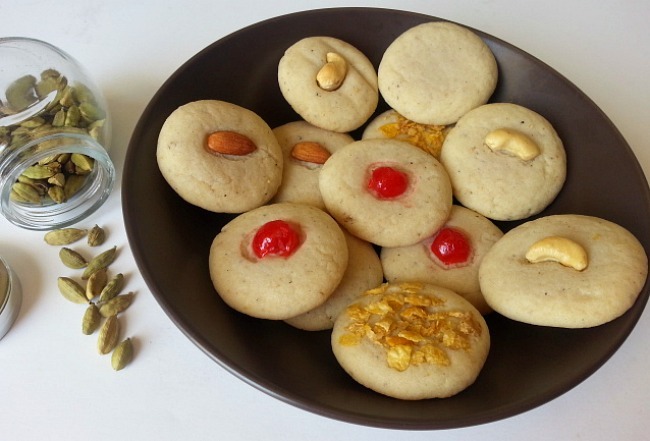 Nankhati is a melt in you mouth biscuit made with flour, ghee, sugar and cardamom. Unlike stated online that they were made for Christmas they were actually an everyday biscuits for evening tea. Ghee is clarified unsalted butter which has a lovely browned butter smell. It has the milk proteins removed and has a high smoke point, making it perfect for cooking. I have made it twice before. It just takes a little of patience. Since ghee is not easily available at local grocery store I decided to use melted butter. This recipe is vegetarian, has no eggs and just 5 ingredients that are in most kitchen pantries and is really quick and easy. A great snack for all the outdoor activities we are heading towards with the warm weather. I used to love these cookies but as I grew older and saw them around all the time I just did not like them anymore. But time does has a great sense of humor if you know what I mean :-). Lately I suddenly started to crave for them with my evening tea. A few variation you can try is replacing white flour with whole wheat and butter with oil. 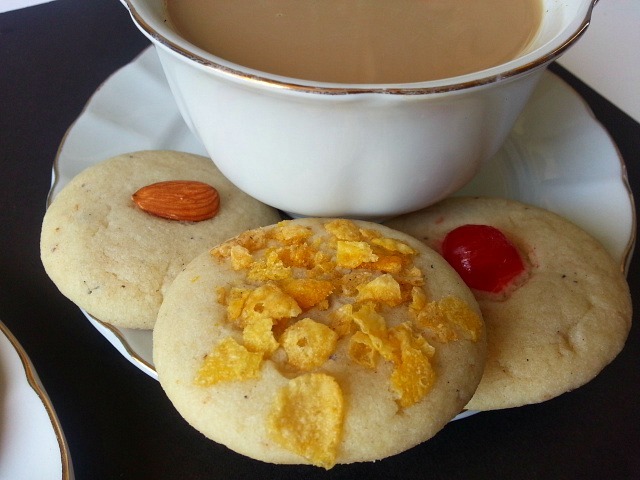 The popular toppings for these biscuits( Biscuits is a word used more often than cookies in India) were cashew, cherry, corn flakes or just plain. 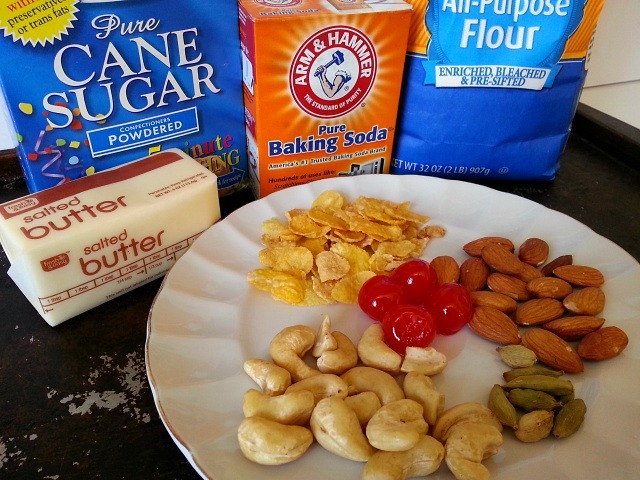 Mix well flour, sugar,cardamom powder, baking soda and salt. Add the melted butter and mix to form a nice smooth dough ball. 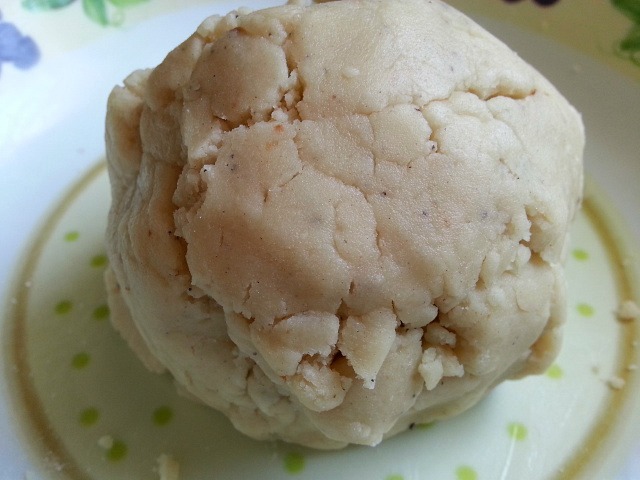 Divide the dough in 12 equal portions and shape into a ball an then lightly flatten it. Place the on a cookie sheet and bake approx 15 to 20 minutes till you smell the cookies and they slightly change color. Do not over bake as they will be burnt underneath. Let cool to harden the biscuits. Enjoy with a nice cup of hot tea. I make Norwegian Forest cookies ever Christmas. This seems somewhat similar. I look forward to trying this recipe. Is there a lot of cardamom in Goan baking as well? Cardamom is used a lot in desserts and sweet recipes in Goa along with nutmeg, cinnamon on the other hand not so much. These look awesome. Going to have to try these for my boys. This would be such a great alternative to American deserts. Thanks for sharing. Wow just love the crumble in mouth texture of nankhati..
Oooooo I remember these so fondly, Mum used to make them in Kenya growing up. I’ve never tried to make them, but now that I have the recipe, I surely will 🙂 Thanks Nandini, enjoy your weekend. They look super yummy and adorable!! I think I may have to try these this week. They look amazing. Amazing how universal truly great recipes are. My grandmother – German – used to bake cookies that looked almost exactly like yours. I don’t remember their name, but I do remember they were delicious. Thank You Mr Stan. I am happy that I changed your mind on the cookies :-). You and Mrs Stan have a great week ahead. Omg I remembering having this when I visited Goa..I’m so glad u posted the recipe! They look so cute and remind of a biscuit from my childhood which was called Melting Moments. Lovely to discover that you are nostalgic for your cookies again. 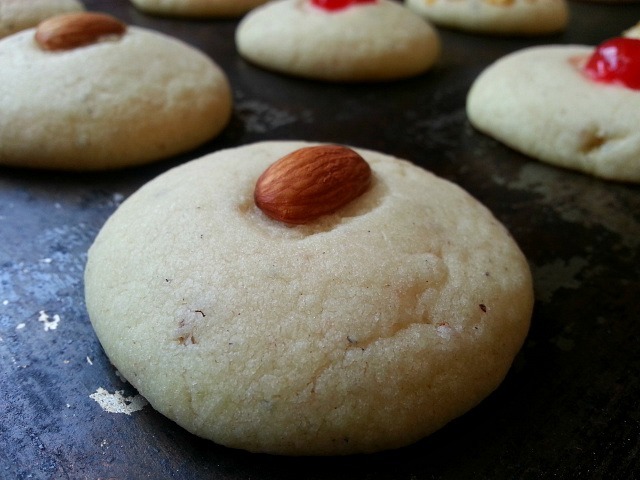 look lovely do you ever make these with besan flour (chick pea)? seems the cardamom and chickpea would go well together! also think it might be nutty in flavour with the besan and a bit crunchy – curious to hear how you get on – do let me know! Sure Adel will try to post it sometimes soon. Regards. These looks absolutely delicious! I am drinking my morning coffee as I read this post and I wish I could reach trough the screen to serve myself one of these to go along !! Thank You Renee so much. They look delicious and very easy to make. 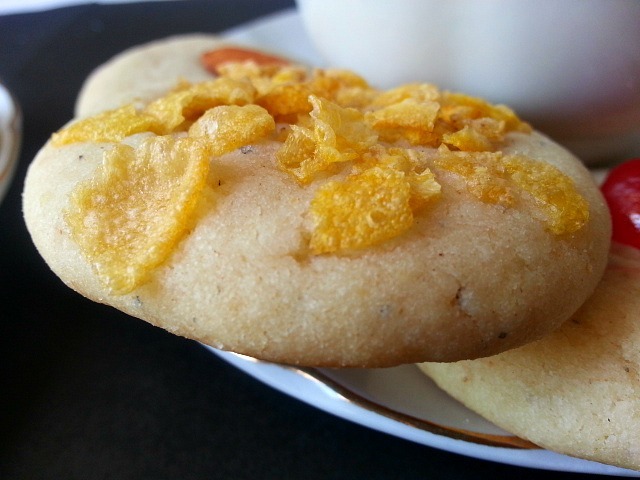 The cornflakes is an unusual topping! Thank You much :-). They do give it a nice crunch when you bite into it. Looks very interesting! I’ll definitely have to try these in the near future! Thank You so much Juessepi for the re-blog. You have a great weekend. Oh yum. These look and sound delicious! Perfect with a cup of tea.